Me and TP went to a lovely party in the New Forest at the weekend (thanks again Jeff & Stef! 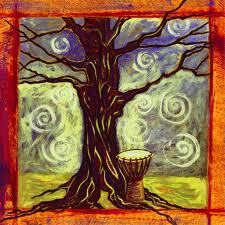 ), and as often happens when there's drumming around the campfire, I recited The Song Of The Djembe, an old poem of mine. Here it is. That delights in the nectar of one single flower. Who delights in the nectar of one single flower. Ah yes, the flower; the key to it all. A slim fluting trumpet, magenta and small. Would only give bloom to the Song of the Djembe. 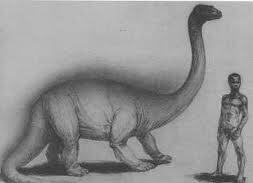 The creature he sought was a small dinosaur. From a delicate flower. It tickled his thinking. And as for the flower, he knew what he knew. He knew what it looked like. He knew where it grew. So he rolled back his shoulders, and loosened his mouth. He hefted his djembe, and he headed off south. After many weeks journey he came to the place. A dim jungle clearing. A magical space. He sat down with his djembe and tightened its ropes. Gave breath to his palms as he gathered his hopes. He knew all the rhythms, many since birth. And boomed deep and down to the Mother Earth's womb. All gathered to hear the drum's summoning words. And circled to hear what his djembe did say. From a fruit-laden thicket came huge russet hogs. Snakes poured forth lissome and smooth from their logs. Would entice the approach of Mokele M'bembe. Strode up to the man with enraged disbelief. Then a mighty sound shuddered the dark forest floor. And alone in the clearing, the man ceased to play. As the silence stretched taut in that dark jungle hollow. And it took in the flower, the man and his djembe. They all dropped from from his mind, and he sat there quite dumb. So he did what came natural, and beat on his drum. And delights to the dance of Mokele M'bembe.